1805 June 1. Robert Grattan Lebby, the only child of Robert Lebby (1767-1810?) and Catharine Grattan Lebby ( -1811), was born in Charleston, South Carolina. 1811 At age six he was left an orphan at the death of his mother, since his father had already died. He was possibly raised by an uncle or aunt or more likely by Peter and Violetta Wyatt, since Wyatt had been named his Trustee and Guardian in his mother’s will. 1826 At age twenty-one Lebby graduated from the Medical College of South Carolina and probably began his practice on James Island. 1827 His first official position was as Acting Assistant Surgeon, U.S. Army, at Fort Johnson on James Island during the yellow fever season. 1828 March 15. At age twenty-three Dr. Robert Lebby married Elizabeth Esther Rivers (1809-1882), age nineteen, daughter of Henry Sterling (pronounced Starling) Rivers (1778-1826) and Esther Shaw Rivers (1770-1810) of James Island, St. Andrew’s Parish. The ceremony was probably held at James Island Presbyterian Church. Dr. Lebby centered his practice on James Island but also practiced in Charleston. He maintained a plantation on James Island, where he had quarters at Fort Johnson. 1828 Dr. Lebby became Assistant Surgeon, U.S. Army, serving in that capacity until 1832. He later held other positions in the Army, totaling thirty years (until 1862). It was during this time that he served in the second of the Seminole Wars in Florida (1835-1842). 1839 In the absence of Captain Brewerton, who was in charge of completing the construction of Fort Sumter, Dr. Robert Lebby surveyed and located the first marks for the site. 1846 June 19. He wrote a letter to Dr. Thomas Lawson offering his services in the Mexican War. Texas had gained its independence from Mexico in 1836, and on July 4, 1845, it was annexed as a state to the United States. The subsequent war with Mexico lasted until 1848. Dr. Lebby did not serve in that war. 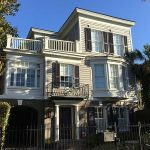 1850 At age forty-five Dr. Robert Lebby moved the center of his medical practice from James Island to Charleston. 1851 June 4. Dr. Lebby became a member of the New England Society of Charleston. He was chairman of the Committee on Charities for a number of years. He also chaired the committee that bought three lots in Magnolia Cemetery and erected a monument to New Englanders there. 1857 Dr. Lebby was alderman from Ward 4 until 1861, when the Civil War started. 1862 During the Civil War (1862-1865) Dr. Lebby served as Surgeon, C.S. Army, first as Surgeon of a field hospital and then of the Wayside Hospital, located on King Street opposite Cannon St. in Hacker’s Yard. Gen. Beauregard then appointed him to Receiving and Distributing Surgeon of the First Louisiana Hospital in Charleston. 1865 At the end of the Civil War Dr. Lebby again served as Acting Assistant Surgeon, U.S. Army, until 1866. This service was with the Bureau of Refugees, Freedman and Abandoned Lands. 1866 At age sixty-one, Dr. Lebby returned to private practice. 1868 Without solicitation on his part Dr. Lebby was elected City Registrar by the Pillsbury Council, a position he held until 1871. 1868 Dr. Lebby was made the Port Physician of Charleston. 1873 He was again elected City Registrar, serving until 1877. 1873 January 8. Dr. Robert Lebby was appointed Surgeon General of South Carolina and was State Health Officer for a number of year. He worked to improve the quarantine station at Fort Johnson. 1878 He was elected for the third time as City Registrar, serving until 1880. 1880 In a business letter Dr. Lebby gave his address as 49 Broad Street. In earlier correspondence (1865) gave his address as 49 Beaufain Street. 1881 January. Dr. Lebby was reappointed as Port Physician of Charleston. 1882 December 17. At age eighty, Elizabeth Rivers Lebby died in Charleston. 1887 At age eighty-two Dr. Robert Lebby Sr. died in Charleston. He had been a member of Grace Episcopal Church, the New England Society of Charleston, the Medical Society of South Carolina, Union Kilwinning Lodge, the South Carolina Society, and the Washington Light Infantry. Lavelle, Brittany [*]. Historic Preservation Research. May 2014. Copyright © 2019 A Trezevant Family Project. All rights reserved.